The Current Clips tab in the Clip List Manager lists the most recent clip history of the Windows clipboard. Selecting a clip in the list displays the content of the clip in the right side clip viewer. The Save button copies the selected clip to the Saved Clips list where it is permanently stored (Jarte Plus only). The Clear button allows you to clear the current clipboard contents, clear the Current Clips history list, or both. 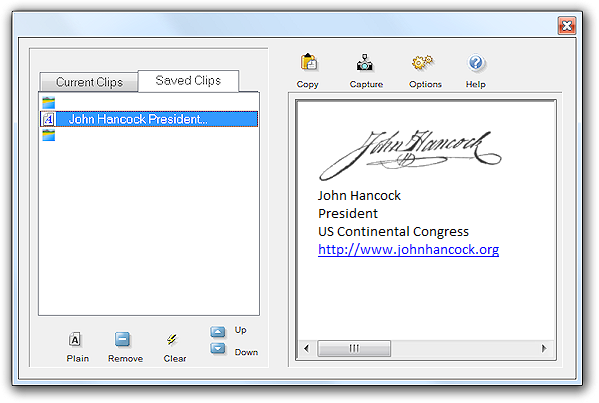 The Copy button allows you to either copy the selected clip to the Windows clipboard, or both copy the clip and paste it into the current document. Note that the Copy button is disabled when the first clip is selected since that clip is already on the Windows Clipboard. Double clicking a clip in the Current Clips list copies the clip to the clipboard. See Screen Capture for information about the Capture button. The Saved Clips tab in the Clip List Manager lists clips that have been previously saved. Selecting a clip in the list displays the content of the clip in the right side clip viewer. The Plain button is used to convert a rich text clip into a plain text clip. This is useful for clips whose formatting characteristics should conform to those of the document the clip is being pasted into. The Remove button deletes the selected clip from the Saved Clips list. The Clear button deletes all of the Saved Clips at once. The order of the Saved Clips can be changed through use of the Up and Down buttons. Stay On Top - Prevents the Clip List Manager window from being obscured by the Jarte program window by keeping it in front of the program window. 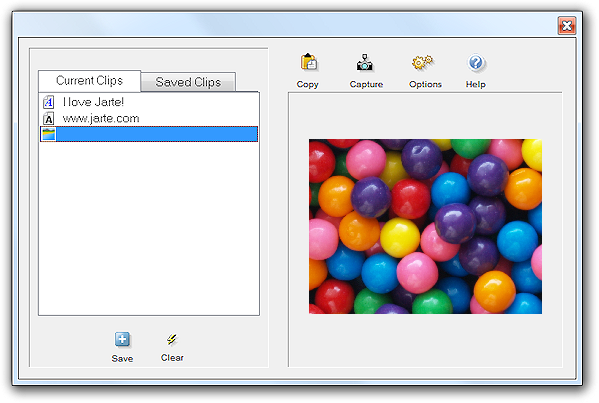 Always Paste Selected Clips - When this option is turned on actions that would normally copy the selected clip to the Windows clipboard (i.e., selecting clip from Clip List menu, double clicking clip in Clip List manager, or using the Clip List Manager's Copy button) will also cause the clip to be pasted into the current document.